We are very privileged to have become the very first Dallas office-based surgery facility accredited by the Joint Commission! While there are several organizations that accredit surgical facilities, The Joint Commission is undeniably the gold standard. The Joint Commission is the nationally-recognized leader in hospital and ambulatory surgery center accreditation, and has recently begun accrediting office-based surgery (OBS) facilities. Learn more about OBS accreditation here. Our state-of-the-art office-based surgery facility was specifically designed and built according to the very stringent Joint Commission standards, and as such is unique and unparalleled in the Dallas area. Texas Oral and Maxillofacial Surgery has been accredited by The Joint Commission as an Office-Based Surgery facility since 2005. We are proud to be the first and only Joint Commission-accredited Office-Based Surgery facility in Dallas, Texas. In addition, we are one of only two Joint Commission-accredited oral and maxillofacial surgery practices in the state of Texas. Only nine other facilities in Texas have achieved Joint Commission Office-Based Surgery accreditation. We work hard to prepare for our accreditation survey every three years, and we encourage you to participate with us in this endeavor. Our efforts are focused on improving patient safety and surgical outcomes, and we believe that, as a result, we will be able to achieve and exceed our goal of providing the highest possible quality patient care services. 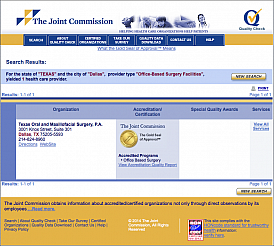 The Joint Commission is an independent, not-for-profit, national body that oversees the safety and quality of health care and other services provided in accredited organizations. The Joint Commission is universally recognized as America's premier accrediting body for hospitals and surgery centers. The Joint Commission performs an on-site survey of our facility every three years. This is a voluntary process that results in substantial expense to the practice. However, we believe that accreditation is in the best interest of our patients and staff. When an individual has any concerns about patient care and safety in the practice, which the practice has not addressed, he or she is encouraged to contact the practice's management. If the concerns cannot be resolved through the practice, the individual is encouraged to contact The Joint Commission. The public may contact The Joint Commission's Office of Quality Monitoring to report any concerns or register complaints about a Joint Commission-accredited health care organization by either calling 1-800/994-6610 or emailing complaint@jointcommission.org.